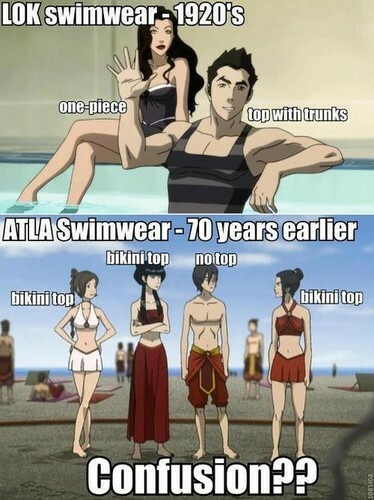 Legend of Korra vs. Avatar: The Last Airbender Round 1 Swimwear. . Wallpaper and background images in the অবতারঃ দ্যা লাস্ট এয়ারবেন্ডার club tagged: zuko aang sokka toph katara azula avatar the last airbender. The designer's head get mixed up or something??? (: LOVE THIS PHOTOTHINGYABOB. still, i DO like the swimsuits, even tho they r out-dated. ^You're using swimwear as a reason to prefer this series to Last Airbender? And this is the cool thing about fictional worlds with their own timelines and cultures: They don't have to have done these things in the same order that some of our societies did.